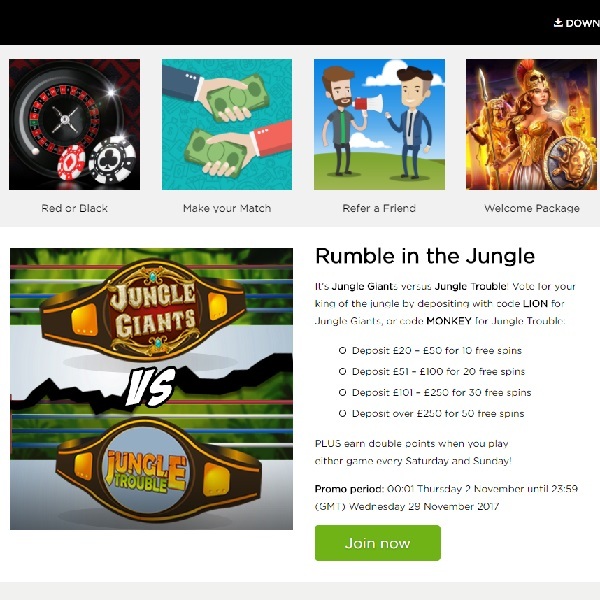 This month Casino.com is running its very own Rumble in the Jungle and giving you the chance to earn a huge number of free spins. It is a competition between Jungle Giants slots and Jungle Trouble slots. You need to vote for your favourite by depositing using the code ‘LION’ for Jungle Giants and the code ‘MONKEY’ for Jungle Trouble. If you deposit £20 – £50 you’ll get 10 free spins, deposit £51 – £100 for 20 free spins, deposit £101 – £250 for 30 free spins or deposit £250 or more for 50 free spins. Furthermore, you’ll receive double points when you play either game on Saturdays and Sundays throughout the month. Make sure you don’t miss out, head over to Casino.com and start voting for your favourite slot and earning plenty of free spins.